Flattened heads of white flowers from December to April, followed by dark blue-black fruit. This lovely, long-flowering laurustinus is perfect for brightening partly shady areas when little else is in flower. Reliable and easy-to-grow, the dark green foliage provides a dense backdrop against which ornamental or feature plants can more easily be seen. Nothing to criticise. Plant well packed and in good condition on arrival. Excellent communication from the company at all stages of transaction. We have a very large established viburnum in both our front and back garden hedges (over 2m high). I'm not exactly sure what type of viburnum they are, but they're both destroyed with viburnum beetle. I've only just identified what it is (I thought the smell was fox wee!!!) It's happened repeatedly for at least 3yrs. Any advice on the best way to rid the pests and get the shrubs back to a heathy state? We only get very very limited flower on them. Hello, You can either try to pick the grubs off by hand, or (if the plant is not flowering), you can use an insecticide. Organic insecticides that contain natural pyrethrins, or chemical insecticides containing lambda-cyhalothrin or deltamethrin can also be used - ideally when they first appear from mid-April. My mother in law's neighbor has just installed a horrible white concrete fench between the gardens and the piece next to my mother in law's kitchen window needs to be screened. There is no soil there so she proposes to get a wooden planter with trellis attached. I think this will be east facing but the garden is quite sheltered. She is thinking of planting a Virginia creeper but I think there might be better alternatives as the space is only 6ft high by about 4 ft wide. I'm thinking a shrub might be better, eg viburnum - but needs to be trouble free and quick growing as m-I-l is already 97 years old and wants to enjoy it. I know hedera is the obviously solution but she is against it! thoughts please! Hi Would this Viburnum be happy in a container? I have a 55L container I want to use, but not sure how quickly it might outgrow this... Thanks! Hello, These plants tend to do quite well in pots, provided they are kept well fed and watered. I would have thought that the 55 litre pot should be fine for at least 2 - 3 years, but it may need to get potted on in time. I have two viburnum tinus, have had them for 3 years and they have never flowered. Both are in partial shade, well-improved clay soil. 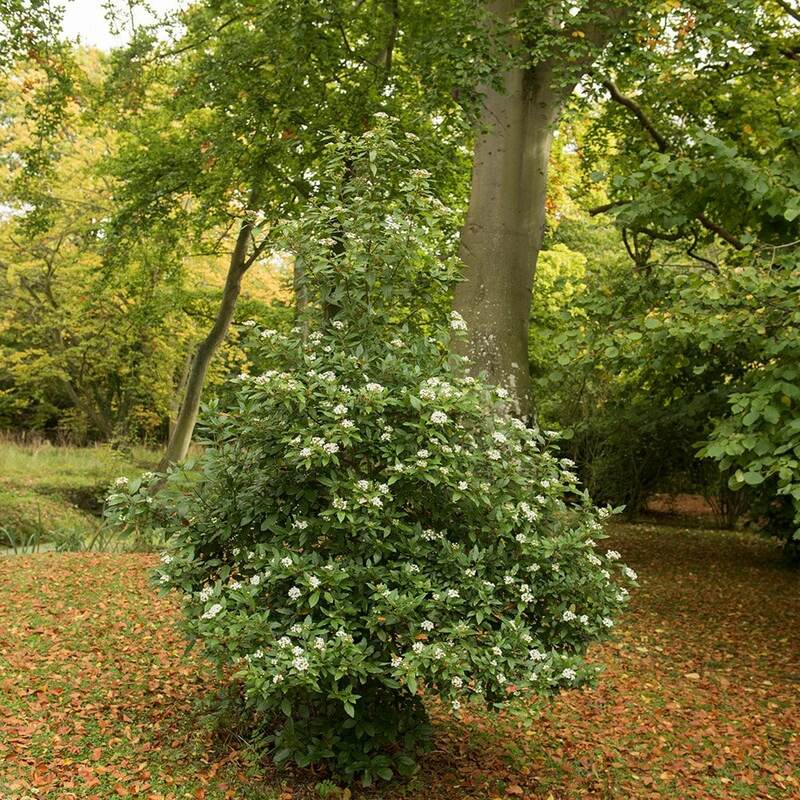 Hello, I was thinking of planting a Viburnum Tinus at the back of a shady border to act as an evergreen backdrop and for its winter flowers. However, it's not a very deep border and the space available would only allow for a spread of 1-1.5m and height of c. 2m. Is it possible to maintain a Virburnum Tinus at this kind of size by pruning it each season or would that be difficult to achieve? I'm open to alternatives if you can suggest any! Thank you!